It took all three singers to convince me that it was mine. The next day I drove it to the Science Museum of Virginia where I worked. I could not stop looking at it. All day I peeped out a window overlooking the parking lot to make sure it was still there. I told everyone I was going to keep it forever. In 1991 our son Jay’s baseball team won the Virginia State Little League Championship. The team was flown to Florida to compete in the Southeast Regional Tournament. Bob decided to take the Miata on its first long road trip. Bob is six foot three inches tall; getting in and out of it was not easy. Adding two tall, skinny preteen boys was even harder, but Jay and his friend Ethan found riding in it to be much more fun than losing their first game. After retirement we spent seven years living on the Outer Banks but continued visiting our Richmond friends. Of course I went back and forth in the Miata. During one visit I was driving my friend Kathy home. When I saw a “No Left Turn” sign I decided to ignore it. Only when I bumped over a curb and ended up in an empty parking lot did I realize that the road was at a 45-degree angle. We got to her house although I knew something major was wrong, and Kathy’s glasses had flown off her face and disappeared. The right front wheel was badly damaged. Bob had to drive four hours from the beach to rescue me the next day. Two years later, as I was lowering the convertible top, I noticed a glint of something metal. Under the hinge on the driver’s side I discovered the missing eyeglasses, intact. I refused to give up my 23-tear-old Miata when we moved to Colorado. I was confident it was healthy enough to come along. Our strategy, since Bob was not sure it would make it that far, was for me to leave one hour earlier than he and Barley. By lunchtime he had caught up with me; by dinnertime he had caught up with me again. We did this for three days until we arrived safely at our new home in Fort Collins. After the move the odometer rolled over to 200,000 miles. The Miata was invited to spend winters in a neighbor’s garage in exchange for my looking after their house while they were away. When I retrieved car in April I noticed a fluid leak. It turned out to be brake fluid, leading to an expensive repair. A week later I noticed more leaks. Mechanics found three more leaks plus seepage plus torn parts. Repairs could range from $2,000 to as much as $12,000 for a total restoration. Time to lay my Miata to rest. 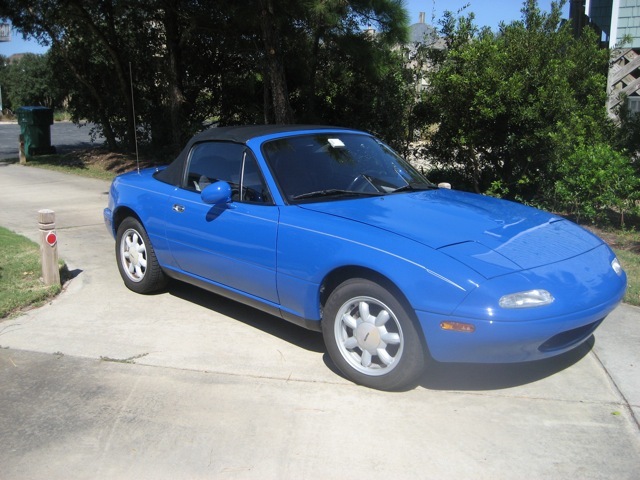 The 1991 model blue Mazda Miata was born in 1990. It was a surprise gift to Fran Green from her husband, Bob, for her 47th Birthday on October 29, 1991. It died at the age of 27 with 204,000 miles, having traveled as far south as Florida and as far north as Vermont. In 2013 after living in Richmond, Virginia, and Corolla, North Carolina, it relocated to Fort Collins, Colorado. During its lifetime it survived a paint job, three convertible tops, and a few minor scrapes and bruises. In its old age, it could be said that it “shakes, rattles, but it still rolls.” On May 31, 2017, it rolled into Dellenbach Motors. Death was caused by a series of leaks, worn out parts, and the need for intensive medical care. Its life was sacrificed, along with a 2006 green Subaru Forester, for a 2017 blue Forester. A 2015 Subaru Forester survives it. Fran and Bob Green and Barley also survive. No service is planned at this time. May it rest in peace. It is destined for an afterlife with a Dellenbach employee who had previously owned a red 1991 relative. The Greens have welcomed a copper-red 2010 Miata into their family.